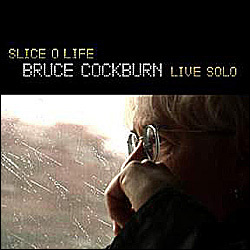 31 March 2009 - Slice O Life - Solo Live has been released. There is a bonus track, Stolen Land, available at iTunes. You can also listen to a podcast at www.cbc.ca/Q. Bruce played Last Night Of The World and World Of Wonders. (Interviewer Jiam Ghomeshi) You can watch this live on YouTube - Bruce Cockburn on Q TV.